Character: A medium-bodied, tends lightly vegetative with hints of cut grass.Top quality Senchas like this offer a light richness that can't be found with other teas. Considered a good tea for everyday drinking by the Japanese, Sencha Akaike offers long notes of wheat, clover honey, sweet grass and subtle seaweed. The cup pairs exceptionally well with foods of all sorts, it makes an exceptional palate between courses. 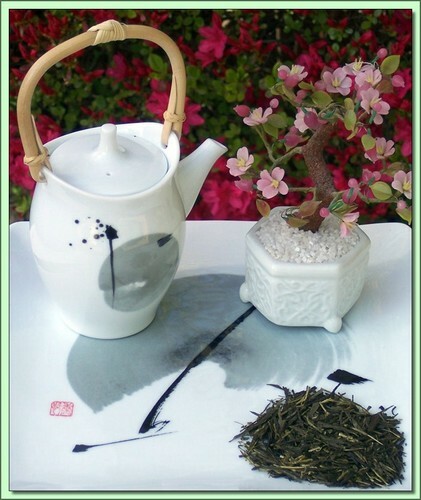 Organic tea is produced without the input of chemical fertilizers or pesticides and herbicides. Certified Organic by QMI Organic Inc. Certificate #: 150 - 2008. USDA Certified Organic. Hot Tea: This tea is best enjoyed by pouring boiling water (atypical for senchas) over the leaves (1 tsp per cup) for 15-20 seconds (longer=stronger). Don't remove the leaves. Can be infused repeatedly 3-4 times using higher temperatures & shorter infusions until flavor is exhausted. Iced Tea: Pour 1 1/4 cups of hot water over 6 bags of tea and steep for 5 minutes. Pour into pitcher while straining leaves, add ice and top up with cold water to make a quart of iced tea. Garnish and sweeten to taste.